Picture - Vickers Valparaiso I in Portuguese service. The Vickers Valparaiso was a British light bomber biplane of the 1920s. It was designed by Vickers as a development of its Vixen for export, being sold to Portugal and Chile. The Vickers Valparaiso was a derivative of the Vixen I for export purposes. It was renamed Valparaiso to distinguish it from the Vixen, which as it used classified government equipment, was unavailable for export. Two versions were available, one powered by the same Napier Lion as the Vixen, known as the Type 93 Valparaiso I, while the Type 92 Valparaiso II was powered by the Rolls-Royce Eagle engine Other than their engines, the Valparaisos were very similar to the Vixen I, both being single-bay biplanes with wooden wings and steel tube fuselages. Both versions were purchased by Portugal, who ordered 10 Valparaiso Is and four Valparaiso IIs, with the Lion-powered aircraft to serve as reconnaissance bombers and the lower powered Valpariso IIs to serve as advanced trainers. In 1928, Portugal decided to license produce a modified Valparaiso powered by a Gnome et Rhx�ne Jupiter radial engine, and a single Valparaiso was modified by Vickers to use the Jupiter, followed by the production of 13 aircraft, designated Type 168 Valparaiso III by OGMA (Oficinas Gerais de Material Aeronx�utico). Picture - Vickers Valparaiso III in Portuguese service. 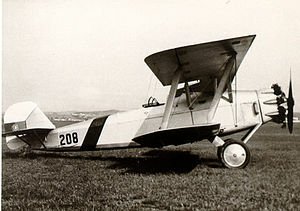 The Portuguese aircraft proved to be successful in service, with two carrying out a long distance tour from Portugal to its African colonies of Angola and Mozambique and back in 1928, with the success of the aircraft resulting in the decision to license produce the Valparaiso III. The radial-powered Valparaisos also proved successful in Portuguese service, remaining operational until 1943, finally being replaced by Westland Lysanders. A single Valparaiso I (actually the prototype), was sold by Vickers to Chile in 1924. It was successful in Chilean service, resulting in an order for a further 18 modified aircraft, which reverted to the original name of Vixen, as the Vixen V.
Napier Lion-powered export version of Vickers Vixen. 11 built. Rolls-Royce Eagle-powered version. Four built. Version powered by Jupiter radial for Portugal. 13 licensed built by OGMA. Andrews, E.N. ; Morgan, E.B. (1988). Vickers Aircraft Since 1908 (Second ed.). London: Putnam. ISBN 0 85177 815 1. Donald, David (Editor) (1997). The Encyclopedia of World Aircraft. Aerospace Publishing. ISBN 1-85605-375-X. Lopes, Eng. Mario Canongia (1985). "Vixen, Venture , Valpariso: A Forgotten Family of Vickers Biplanes". Air Enthusiast (Bromley, Kent, UK: Pilot Press) (Issue 27 (March June 1985)): pp. 43-51. ISSN 0143-5450.